New Delhi: Six Commonwealth Games medallists from the track and field, shooting and weightlifting disciplines were on Wednesday inducted into the Target Olympic Podium Scheme, with the sports ministry including discus thrower Seema Punia and leaving out seasoned shooter Gagan Narang. 2012 London Olympics bronze medallist Narang was among the 12 athletes to have been dropped due to poor performance and fitness issues. The Mission Olympic Cell met on Wednesday to review the performances of athletes who were part of TOPS and to discuss the inclusion of potential medal-winners in the scheme. Two weightlifters who were originally there only till the 2018 Commonwealth Games were also included, Sports Authority of India (SAI) said in a release. The 34-year-old Punia has been one of India's most distinguished track and field stars. A three-time Olympian, she has won laurels for the country at both the Commonwealth Games and Asian Games. Her standout performance was the gold medal-winning effort at the 2014 Incheon Asian Games. She has also won three silver and a bronze in the Commonwealth Games from 2006 to 2018. Narang had a disappointing seventh CWG appearance, returning without a medal from the multi-sport event for the first time in his career. He has to his credit a stellar eight gold medals, a silver and a bronze at the Games. 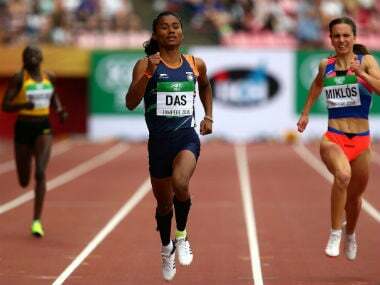 Hima Das, 18, is one of India's most promising young runners. She excelled at the Commonwealth Games, running a time of 51.32 seconds in the women's 400 metres final. She also represented India in the 4x400 relay at the Commonwealth Games. The 23-year-old Navjeet Kaur Dhillon from Amritsar is highly regarded in the Indian domestic circuit for her feats in discus throw. At the Gold Coast Games, she made a successful transition to the senior level, winning a bronze. 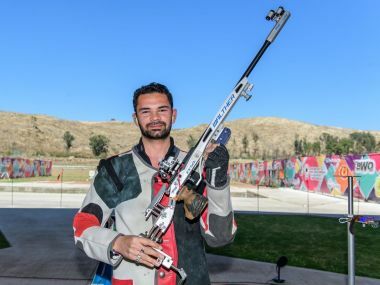 Akhil Sheoran, a 22-year-old shooter, won his first-ever medal at senior level, a gold in the men's rifle 3 position event, at the Shooting World Cup in Guadalajara, Mexico in March this year. 18-year-old Elavenil Valarivan won the gold medal at the 10m air rifle event at the 2018 ISSF Junior World Cup in Sydney, setting a world record in the process. Weightlifting prospect Rakhi Halder has also been included under the TOPS scheme. She recently created a national record in the women's 63 kg category at the Senior National Championships in Mangalore, lifting 128 kgs in the clean and jerk and breaking a 19-year-old record by 2000 Olympic bronze medallist Karnam Malleswari. The government has also included weightlifters Pardeep Singh and Sanjita Chanu who were originally there till the 2018 CWG only. Singh won silver in the men's 105 kg category and Chanu won back-to-back gold medals in 2014 and 2018. Apart from Narang, six shooters, three weightlifters and two track and field athletes were also dropped from the scheme on the grounds of poor recent performances and fitness issues. Harveen Sarao (10m pistol), Puja Ghatkar (10m air rifle), Meghna Sajjanar (10m air rifle), Satyendra Singh (50m rifle 3 positions), Omkar Singh (10m pistol) and Prakash Nanjappa (10m pistol) were the ones dropped.